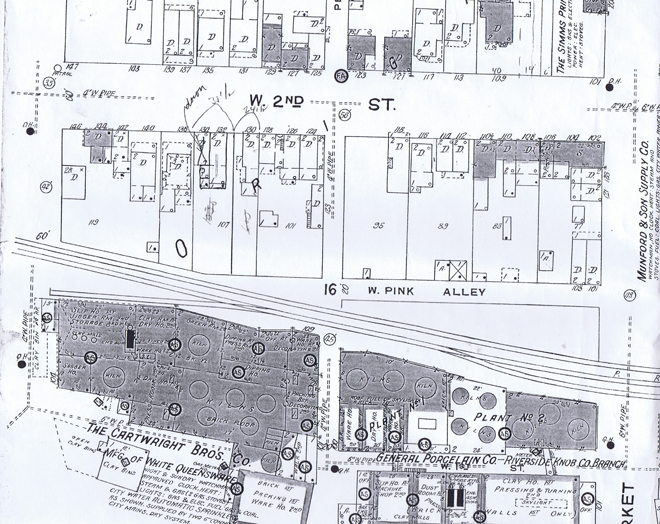 From 1897 Sanborn Fire Insurance map. Jackson Street in on the far left. Market Street is on the far right. A simple diagram of 2nd Street. This section covers Jackson Street to Market. Street. From 1923 Sanborn Fire Insurance map. Jackson Street in on the far left. Market Street is on the far right. It is showing a increase of buildings, many are probably houses in the 26 years between the two maps. This is only a few doors east from the intersection of Jackson Street and W. 2nd Street. You can see St. John's Lutheran Church in the background on W. 3rd Street behind the houses. Sanford Hill House 2nd Street. Most of the early mayors resided on second Street, including the second, Sanford C. Hill, who came to town in 1817 to open a store, then turned to surveying and producing nationally known almanacs. 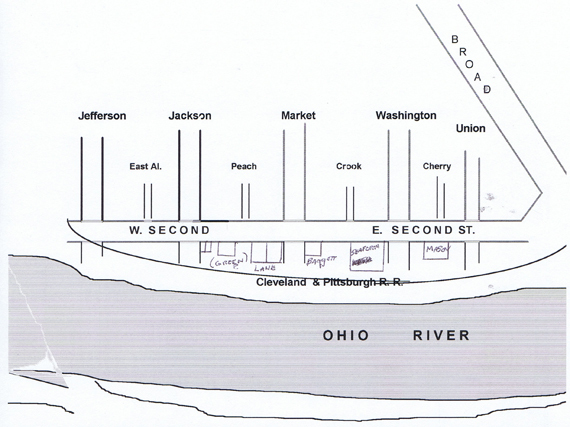 William Devers, fourth mayor, operated the Black Bear Inn, later the Ohio hotel, on second Street. William P. Morris, the fifth mayor, resided at 118 W. 2nd St., and one of the early brick structures in the village and almost opposite the home of Sanford Hill. It was to this home which his sister and his nephew, young Andrew Carnegie -- future steel industry magnant and philanthropist -- came to visit on occasion. A painting of the house by artist David Blythe hangs in the Museum of Ceramics. 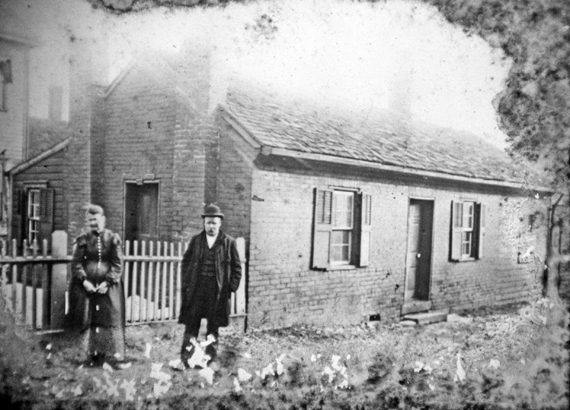 Picture is Carnegie's uncle's home in ELO whre Carnegie stayed from time to time. 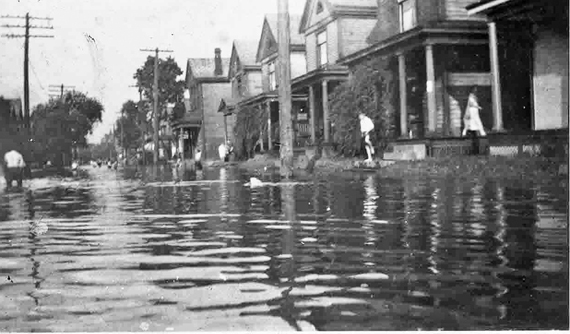 We think that this picture does show at least part of the 100 Block of West 2nd street. Any input on this is welcome. As can be seen from what is presented here we have almost no pictures showing this portion of W 2nd Street. Looking east from some point of the 100 Block of West 2nd Street. It just says West 2nd street but doesn't say which block or give an address. Early 1970s. Courtesy of Inger Lloyd, Inger Lloyd Collection. This almost looks like a reversed picture of the house in the picture above. But the above house looks like it may be a courner house and this one isn't. Not sure of the date of this picture.